India’s energy minister flags massive solar tender of 100GW – by far the biggest in the world. Wake up Australia. India’s energy minister R K Singh has flagged a massive solar tender of 100GW (yes, that’s 100,000MW) – by far the biggest in the world, as the fastest growing energy consumer turns increasingly to renewables to satisfy its enormous needs. “The biggest (renewable energy) tender was floated in Spain. We brought out single tender of 10,000MW which would be opened in July,” Singh said at a function in New Delhi this week, as reported by The Economic Times, the main financial daily. “Now (we) will bring out a bid (tender) of one lakh MW which would also include solar manufacturing and storage (output).” A lakh is an Indian measurement meaning 100,000 units. Singh did not give a direct timetable for the new tender, and given its size it would likely the a few years, but he did say that India will over achieve its renewable energy target of 175GW by 2022. According to the Economic Times, Singh said India has already installed 70GW of renewable energy capacity and had about 12.5GW under construction. “India is making rapid strides in the field of renewable energy and we will overshoot the target of 175GW renewable energy by 2022,” he was quoted as saying at the opening of a small 1.5MW solar plant. Singh noted that 20 cities in India are ranked among the most polluted in the world and there is an urgent need to reduce fossil fuel use, and to deliver electricity to every household by the end of this year. “This is a perfect illustration of the ambition of Prime Minister Narendra Modi’s “Make in India” vision,” said Tim Buckley, analyst at IEEFA. Buckley noted that the economies of scale will be huge, and would require total finance of around $US100 billion. “This might sound far-fetched, but it was reported only last week that SoftBank of Japan was exploring lifting its $US20 billion commitment to Indian solar by 2022 to $US100 billion,” Buckley said. This follows SoftBank’s alliance with the Saudi Crown Prince in a proposal for US$200bn of solar in Saudi Arabia by 2030. Buckley said that given renewables both wind and solar – are already 10-20 per cent cheaper than existing thermal (coal) power generation in India, and half the price of imported coal-fired power, this makes entirely economic sense for India. It also allows India to massively exceed its Paris Climate Agreement commitments, and enter the world stage alongside China as the global leader in low emissions industries of the future. Meanwhile, the Australian federal government still wants to open up ten of the world’s largest new, low-quality thermal coal mines in the Galilee Basin. “It is past time for Australia to realise the speed of the technology and finance led energy system transformation currently accelerating before our eyes,” Buckley said. That’s a lot less coal from Australia. The operative word here is “could” but in reality with so many coal fired power stations being built in Asia that will need Australian coal this is just more propaganda spread by renewable rentseekers. The visit of the Queensland Premier to Japan a few weeks ago and the meeting she had with government and power officials said it all. If Australia in any way hinders the supply of coal from Australia to the 50 new HELE power stations being built Japan would pull all investment from Australia and mainly Queensland sending the state bankrupt. So much for less coal being exported but you can believe what you like. We need to plan for what will happen after the inevitable, not cling to the wishful. Are you Tony abbott? @Giles Parkinson surely it is time to block this so called person……..FFS you Yelled at me for a term you didn’t like ……yet you allow this idiot space on the site……. AND I HAVE GIVEN YOU CASH MONEY! yet you allow this ———— to comment! How about actually answering his comments rather then wanting him banned? That would be a much better way to proceed. There are a lot of answers to Ertimus Waffle and its true that in virtually every region in the world there is a fight for market share between coal and renewables. Japan has started 8 new coal plants and has plans for another 46 over the next decade according to a Science Direct article. As an Australian I am happy about this because Japan will have to import all its coal making it one of the most expensive electricity producers in the world at current prices, if not the most expensive. Japanese industry must love that. Meanwhile in China, a vastly larger coal consumer about 75% of the country is in the red “ie no new coal plants” zone. You probably would build a new coal mine on the back of a Japanese contract, but personally as a financier I would still be very nervous. It is overwhelmingly odds on that the costs of carbon will be higher 10 and 20 years down the track than they are today, and how do you factor that into the financial plan for your mine? Can you get bank finance? Can you get insurance? Maybe this year but in ten years time? In twenty years time? 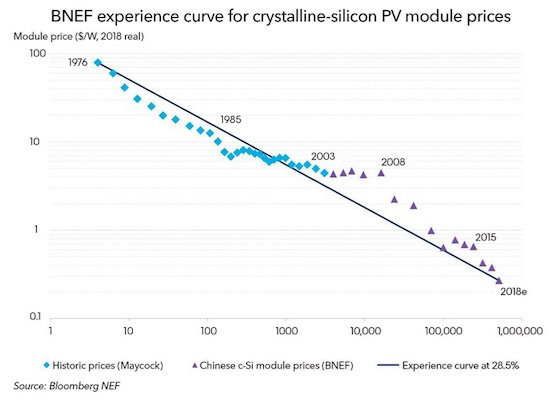 The way solar panel costs are falling there will be a saturation of solar panels (i.e. installed on every available surface), and particularly in the region between the tropic of Capricorn and the tropic of Cancer. Most of those new coal plants being built in Asia will probably be stranded assets in 10-20 years, less than halfway into their designed operating life. Amazing that India of all places is schooling the world on climate action and the sustainable energy revolution. Such extremes of poverty and wealth in that country, where grid sourced electricity and utility provided clean running water from taps is a fantasy for perhaps half it’s population. Only a few years ago they were turning up to climate talks portraying themselves as beggars. Now giants of advanced technology and climate ambition. They, perhaps more than Australia even stand to suffer if climate change advances on estimations of damages done. Their “green revolution” for chemical input farming has them self-producing much of their food, but relies heavily on monsoon rainfall to recharge aquifers. The great Ganges basin once birthed organised agriculture with hand dug wells, now they drill to 200m to bring up water for agriculture. If the monsoons stop or are intermittent and the Ice Caps stop delivering regular flows to Asia’s five great rivers then there will a high likelihood of mass starvation. Perhaps instead of going to Adani’s relatives weddings it would be better if conservative Australian politicians and mega-rich toured the poor states and saw distributed renewables taking off at lower costs than coal and gas, let alone nuclear, could ever deliver in that country. Solar is now able to generate electricity more cheaply than other power sources so this isn’t necessarily out of the goodness of their hearts. I’d love to see them implement a carbon tax. When was politics ever solely about the goodness of peoples’ hearts? Point is they are not just accepting solar and wind but doing what government must do in driving deployment, if we are to have a remote chance of averting catastrophic climate change. Acting decisively, the opposite of what is happening at Federal level and some states, like WA. and NSW. Indian politics is more notoriously corrupt than Australian even (we ranked extremely high on one corruption indexes that looked at politicians links to businesses, believe it or not), so a CT may prove even tougher going in India than Australia. In WA where I campaign on these issues, it’s a commonplace for politicians and Synergy (GTE with 48% of the power business and a retail monopoly on <50 MWh/yr) execs to say coal will be with us for the foreseeable future rather than broach the rate of forced retirement for coal or the targets they will set for wind and solar. This mantra that the market will deliver outcomes — just like it has not for a decade in WA c.f. ACT who are now contracted to 100% RE and SA who are contracted to ~50% gets pulled all the time by people who would rather reinforce the status quo. It's so incredibly lacking in foresight or an intelligent sense of what is to come in the near future, and unborn generations, let alone many of the native ecosystems which cannot cope with rapid climate change, as we are seeing already with stag horns booming commonplace in Kings Park for example. India already has a carbon tax of INR 400 per tonne (about 8 AUD). What sectors is it applied to? Universal or just energy? Exceptions and waivers? Hi All, Now all we RE supporters have to do is get our Fed Gov to follow India lead. Coal has to be closed down and the sooner the better. Note we have have to change Gov to do this. The problem is the non-existent leadership, or rather stealership; paying themselves higher wages, but ask the population to sell the ABC and go on the pension at the age of 70. You give them a pile of crap and paint it black and they go raving about clean coal. But then… the majority of Aussies voted for them… good on’ya. Australian states should have subsidised large scale solar power stations that have tracking instead of rooftop solar panels that have no tracking. Indian states went for the cheaper and smarter solution. Good on them. Just so. The only reason rooftop solar is even a thing here is that our distribution and retail networks are so incredibly expensive, partly through incompetence and bad design, mostly through naked greed. It is utterly ridiculous to suppose that domestic rooftop solar should be anywhere near industrial-scale solar in dollar cost, but here in Australia it is. The *actual* cost, of course, is much higher. The other thing is, we know not how cheap the large solar power stations in AUS are. ie, other nations conduct solar power auctions and we know how cheap solar power in Chile, India, Dubai, is in terms of cents/kWh but not here! And the rooftop solar panel subsidy does not reach people living in rental units, so it is yet another subsidy that the poor miss out on. In another 5-6 years the U.S. will be the laughing stock of the world in the Energy arena, with the Trump Administration’s insisting on going backwards in time and investing in fossil fuels like coal and drilling. Another huge step toward losing “Super Power” status on the global stage. Goes to show what a bit of political will can do, in a democracy and against vested interests. It is shameful that certain countries (Australia and the USA) are locked into outdated generation technology and poorer countries are leading the way with RE. I guess now the new LNP spin will be that Australia does not have to do anything as India, China and most of the EU have done all the heavy lifting to reduce CO2 pollution.